Both trips aboard the Lady Jayne with Mull Charters late summer coincided with calm weather, and the second, early in September saw us sailing alongside Ulva, in search of the eagles. 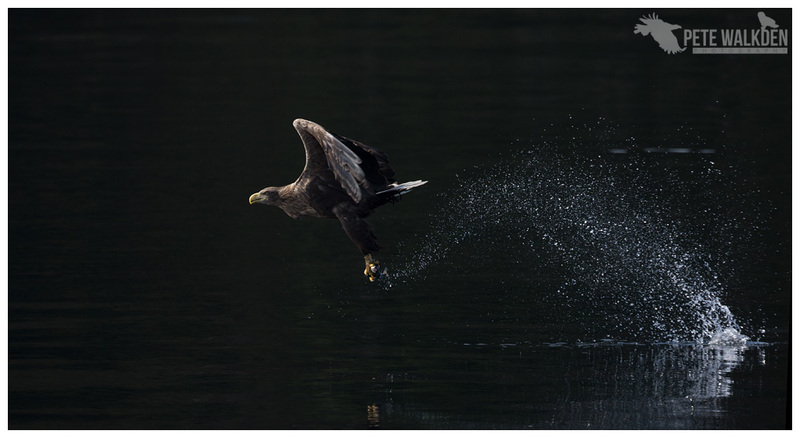 With such flat calm weather, the water reflected the shore, and from certain angles appeared almost black, and with a bit of luck, and skill from Alex throwing out the fish, we enjoyed the sight of the eagle plucking the fish, in unusual light. As usual, I had the camera in manual exposure mode, and was using the relatively lightweight 100-400mm mk2 lens. This allowed me to track the eagle as it descended, and captured a sharp image despite pointing into dark conditions, just catching the eagle's details and the sparkle of the water droplets spraying back from the fish.